Join Amazon best selling author, Brie Arthur (Foodscape Revolution) for a fun afternoon of planting, farm to table food sampling, and a presentation and book signing! The MBG hillside along the herb garden has been transitioning to a more edible landscape – blueberries and citrus as well as strawberry plants are already growing on the hill. 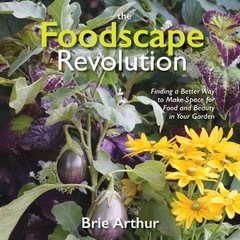 As Brie notes in her book, The Foodscape Revolution, she recommends adding edibles amongst the established plants of trees, shrubs and perennials – we are going to invite the afternoon attendees to join Brie in planting out several edibles that we have been growing in the greenhouse & we will also spread seeds (of Brie’s choosing). This will be a fun opportunity for young families to learn about gardening! Once the planting work is done, everyone will be invited to sit at a long table and pass foods that feature locally grown vegetables, fruits, and other. Mixed green salad with champagne vinaigrette, Gulf Coast Shrimp and Grits, Braised Bock Choy with locally made Bacon, Sweet Tea and Lemonade. Foodscaping is all about making the most of your available square footage while engaging the next generation. Discover how to grow the flowers and food that you love to create a beautiful and bountiful space. Learn about growing in containers and new technologies including patio friendly Aeroponic systems and vertical gardens. The best organic practices are featured to arm attendees with sustainable land management ideas while deterring browsing mammals. From having a party ready patio to a bountiful property border Brie will share expert growing tips for a successful harvest. This presentation is part of the Marion Deane Drummond Lecture Series which is sponsored in part by the Mobile County Commission, District 2. To see other programs in the series, click here. Originally from southeastern Michigan, Brie Arthur studied Landscape Design and Horticulture at Purdue University. With more than a decade of experience as a grower and propagator at leading nurseries she now combines her passion for plants and sustainable land management by communicating the value of gardening. Brie has been dubbed a revolutionary for her leadership in the suburban Foodscape movement and for her work with public schools across the US. She appears as a correspondent on the PBS Television show “Growing A Greener World” and her debut book, The Foodscape Revolution has become a best seller on Amazon. In 2017 Brie was honored as the first recipient of the The American Horticultural Society’s Emerging Horticultural Professional Award. Her second book, Gardening with Grains published by St Lynn’s Press, will be available in 2019.